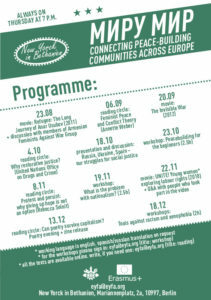 Миру мир: Connecting peace-building communities across Europe – sing up for the workshop | Миру мир: Connecting peace-building communities across Europe – sing up for the workshop – European Youth for Action! The third workshop facilitated by EYFA EVS volunteers will take place on next Thursday – the 18th of December. Title: Tools against racism and xenophobia (2.h). racism and xenophobia – how it works? anti-oppression work – do you know? We believe in non-formal education, skillsharing and peer to peer exchange, which help us to build together a safer space and friendly atmosphere. We are more than happy to have your feedback, we are still learning. The working language is English, but we offer translation into Russian and Spanish. Also coffee, tea and snacks. Suggestions? Comments? Write us on eyfa[at]eyfa.org (title: workshop). Sign up beforehand to help us planning the exercises. The eyfa collective works hard to continue supporting grassroots movements struggling for social and environmental justice in Europe. We need your help to continue existing, please donate if you can or spread this to people with lots of cash. The persons that contribute to this website come from different corners of the world and therefore speak and write differently. What matters for us is that we can understand each other.